In the course of developing this digital library, the project relied heavily on private collectors whose dedication and passion for collecting special items has helped keep the legacy of the Castle and its founding corporations alive. Many collectors are networked with other collectors and their pursuit of the interesting artifacts of historic landmarks and time periods is a crucial element in local history and commercial/business history preservation. Of particular note for this project was the assistance provided by Mr. Charlie Brown, who was introduced to this project through a contact at the NJ Postal History organization. Charlie has generously shared many images found on this site featuring Uneeda, Wheatsworth and National Biscuit Company (Nabisco) and a small selection of Gingerbread Castle items. Charlie’s history as a collector is interesting. See a sample of images from his collection. Charlie Brown spent 31 years with Nabisco as a Sales Representative. He officially started a collecting club in 1994, after trying for years to find any information about the amazing company known as National Biscuit Company, which was later re-branded as Nabisco. His organization has a Facebook page for “Nabisco Collectors” which serves as a place for Nabisco collectors and interested parties to share their common interest. The club is called the Inner-Seal Collectors Club, and Charlie gained permission in 1994 to use the “SEALS OF NABISCO”, and any of the Nabisco Trademarks, which is quite an honor. The organization has a newsletter called the “Inner-Seal Colophon”. Prior to the turn of the century, crackers had a bad reputation at the turn of the 20th century, Adolphus Green the second President of National Biscuit forever changed the way the consumers of that time purchased crackers. Founded in 1898, Nabisco was the first company to take the crackers out of the barrel; they called these “biscuits” not crackers. These unique crackers were named “Uneeda Biscuit”. Nabisco developed a process to place these “BISCUIT” in a package, which kept them fresh for over a year; this process was called IN-ER SEAL. Oreo just turned 100, but they are not the oldest product Nabisco has, in fact, Fig Newton’s, Barnum’s Animal Crackers and Premium Saltines are over 100 years old. The symbol for this early corporation was a little boy, his name was Gordon Stille, he was photographed in 1901 in a yellow slicker, rain hat & black boots, holding a box of Uneeda Biscuit. He was called the “Slicker Boy or Uneeda Kid”. At one time in the early 1900′s, he was the most recognized figure known next to the President of the United States. 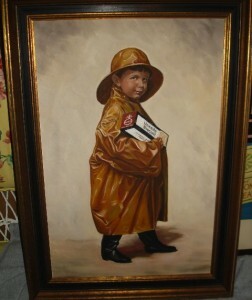 Shown below is a painting given to the VP of Nabisco in the early 70′s. It is an exact replica of the original painting done of Gordon in 1901. Charlie also treasures, in his collection, the glass negative of this image. It is packed in a special dovetailed box and has been safely protected for over 100 years. Charlie obtained the negative from the Nabisco VP, to whom it was given in the 1980′s. “I would say collecting came naturally to me, Country Store is my favorite things, maybe because my Dad had a grocery store. When I married in 1973, Priscilla (Prissy) also collected, so this love of collecting is shared in our lives, she likes Santa’s, Boyd’s Bears and Nabisco. When we were married in early 1973, Prissy went with her dad to a flea market and bought our first NBC tin. Collecting became a part of both our son’s lives, they both collect.